New Release at 90 Niagara in Toronto! 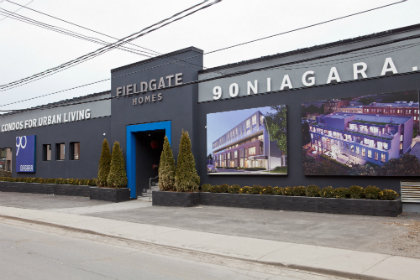 Fieldgate is very excited about the new release at our boutique condo, 90 Niagara, in Toronto! We released a brand new collection of Urban Towns and Balcony Suites. The new release equals a total of 15 new units, and many interested, prospective purchasers have already visited the presentation Centre to tour our fully decorated model suite. The Balcony Suites average around 600 square feet each, while the Urban Towns range up to just over 1,000 square feet. Suite 110 is the largest Urban Town in the new release, reaching 1,030 square feet. This 2-storey, 2-bedroom + Study plan offers the perfect mix of the condo and townhome lifestyles. 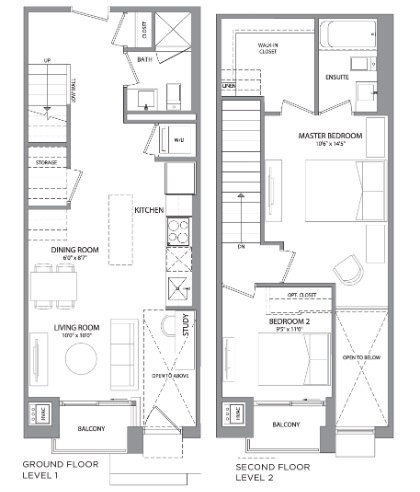 The main level, which is on the ground floor, features an open concept layout that flows smoothly from front to back. Upon entry, the eye is drawn around the entire room, making your home seem even more spacious than it already is. This kind of layout also makes it perfect for entertaining large groups of friends and family. Another notable design feature of the main level is that the study area is open to the second floor, so the work space is bright and open, and connects the living area to the rest of the home. There are two reasons why the second level of Suite 110 is exactly what you’re looking for in a new home. The master bedroom is large for a downtown condo, measuring 10’6”x14’ 5” (over 140 square feet), and the second bedroom has access to a 52 square foot balcony! If you are interested in the new release at 90 Niagara, visit the presentation centre at 90 Niagara Street in Toronto Monday to Thursday from 12pm – 7pm, Saturday, Sunday & Holidays from 11am – 6pm, or call 416-981-0036 to book an appointment for Friday.